Habitat: Grows in partial sun with moist soil. This plant will disappear if planted where it is too dry or too shady. Description: Cardinal flower (also known as red Lobelia) is an herbaceous perennial, 2'- 3' tall with a single stem bearing a 6"-18" spike of bright red flowers. Flowers begin to bloom in mid- to late-July and may continue through September. The nectar of this brightly-colored flower is a favorite of hummingbirds and swallowtail butterflies, making it an excellent addition to the summer garden. Individual red flowers are 1"-1.5" long and 0.75" - 1" wide, in a tubular structure with flaring lobes, one on each side and three lobes on the bottom. The leaves of this plant are alternate, rough-textured and coarsely serrated on the margins. Lobelia cardinalis is clump forming. Individuals are not long-lived but will self-sow and maintain vigor if light and moisture conditions remain favorable. Cardinal flower’s two-celled seed capsules contain many tiny seeds, which germinate easily but take two years to bloom. The seeds are too small for most birds to eat, but numerous insect larvae feed on the leaves. Mammals (deer, etc.) 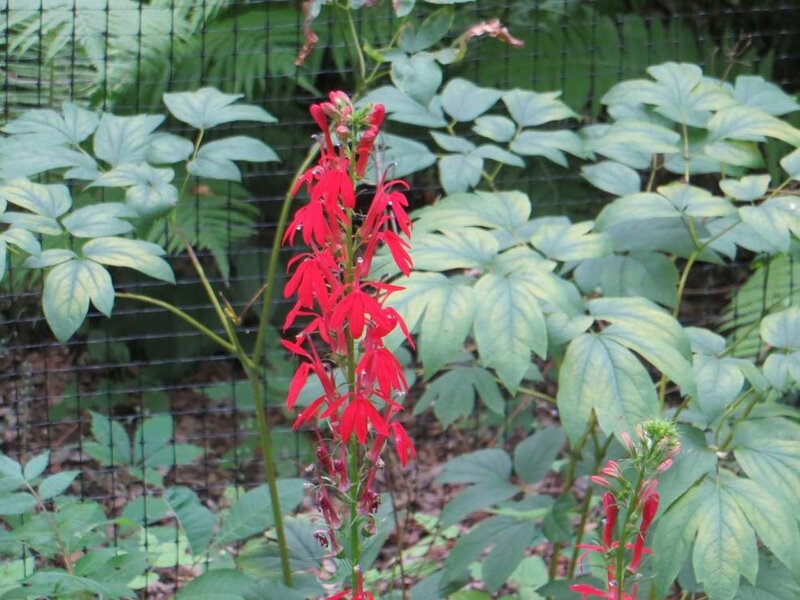 generally avoid the Cardinal flower because there is irritating latex in its foliage. Native Americans used the roots for a medicinal tea and as an aphrodisiac, but all parts of the plant are toxic in large quantities. General Care: Keep Lobelia cardinalis looking its best through its long bloom period by deadheading flowers to encourage reblooming. Because individual plants are short-lived, allow some self-seeding, especially later in the season. Plants may be divided every two or three years. Soil must be kept moist during summer (the plant will tolerate drier soil if there is afternoon shade) but avoid excess moisture in winter, as this may kill the plants. In the fall, mulch lightly but do not cut back. Early spring is the best time for that. Find It: Find this plant in the Bartlett’s Native Plant Garden about halfway up the entrance road on the left, and along our Wetland Walk. When you spot it, take a picture and tag us using #foundatthebartlett .